The linux conference (open source software) is held yearly at various locations around Australia. This year the conference was held in Ballarat. Being green focused, Sae-Ra from the group contacted Fifteen Trees to discuss options about how to run the conference with a small footprint. As a result, delegates, when registering for the conference, had a ‘tick’ the box option to buy a tree for planting in the local area. One hundred and twenty two people decided to take up this option and as a result, 122 trees were planted in the Ballarat district across 3 locations. 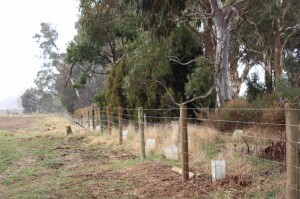 The Vanderbeeks and Zoutendijk families each planted out 60 native trees and the remaining 2 (fruit) trees were planted at Creswick North Primary School. Below are some of the comments and photos taken by the 3 groups. 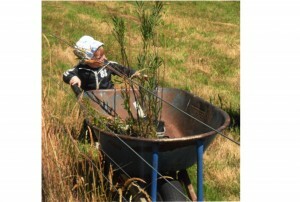 Youngest grandchild gets involved in tree planting. Thank you to the organisers of the linux-conf – and of course thank you to the delegates who chipped in $5.00 each to have a tree planted on their behalf. A very big thank you to the organizers of the Linux Conference and people who attended and provided funds making it possible to obtain our sixty trees. They are all doing well despite some very hot dry periods. It is great to see our nine grandchildren all taking such an interest in the trees. As a colleague of Sae Ra’s on the linux.conf.au Core Team, I’d like to strongly re-iterate how valuable we found the services offered by 15 Trees in our quest to make linux.conf.au as sustainable as possible. For a nominal fee which was an incredibly small percentage of overall registration costs, conference delegates were able to opt-in to carbon offsetting their attendance. I’d strongly recommend this service to other conference and event organisers who wish to implement environmentally aware and sustainable measures into their business practices. I approached Colleen about a year ago as an idea that we had for our conference that was held in Ballarat. I wasn’t sure if it was possible and I wasn’t sure if it was easily done. Thank you so much for making this possible for our conference, it was very well received. I’m hoping that a lot of conferences take up this option in the future, it’s all so easy and painless to do, I don’t see why it’s not just a standard option at all conferences. I’m sure we will get there at some stage.